The Dive Master training course provides scuba divers with the skills to lead other certified divers while also acting as a dive guide. By the end of the course you will not only be able to assist instructors during approved courses but also supervise and conduct dives provided the activities are similar to your own personal training and experience.This course will grant you insight into the physics and physiology behind scuba diving. 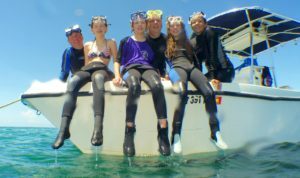 This course is intended for advanced divers who are interested in becoming a professional dive guide or instructor.